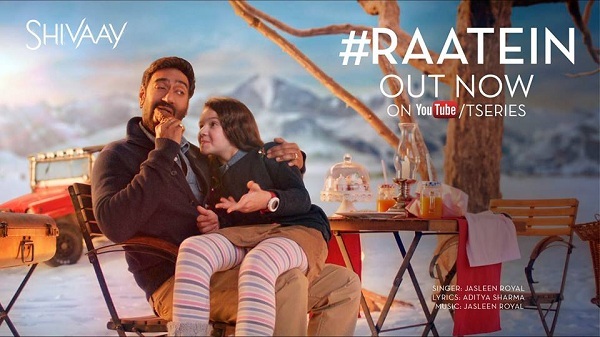 Here is presenting a beautiful emotional song Raatein from the movie Shivaay starring Ajay Devgn, Erika Kaar and Sayesha Saigal. Raatein song is extremely melodious and it is sung by Jasleen Royal. Music is also composed by Jasleen Royal and lyrics are penned by Aditya Sharma. Shivaay is directed and produced by Ajay Devgn and is one of the most anticipated film of the year. Shivaay is slated for release this Diwali on 28th October, 2016. Film is expected to start big at box office. However film is also clashing with another biggie in Ae Dil Hai Mushkil which is also releasing on same date.